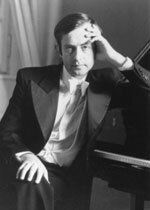 Justin Oprean, Adelina’s brother, was born in Bucharest in 1950 and after his early musical training at the Music School in Sibiu, appeared with the State Philharmonic Orchestra at the age of twelve. In 1969 he entered the Bucharest Music Academy under Professor George Halmos, subsequently obtaining the highest awards. He then continued his studies with Professors Amadeus Webersinke and Alfons Kontarsky. Justin Oprean has performed in Germany, Belgium, Austria, Switzerland, Italy, Hungary, Bulgaria and Britain as well as in Romania. He has made many radio and television recordings and is considereed one of the best known of the younger generation of Romanian pianists.